Back in July, I wrote about my travelling office. 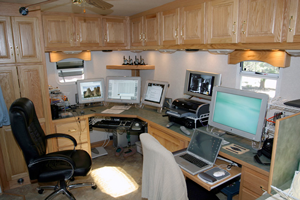 A few days later, Tom Donaldson showed me what the ultimate mobile office looks like. Tom has worked out of a heavilly customized RV rig (British users, read: ‘posh caravan’) for 3.5 years. It’s wired for ethernet, wifi, satellite internet and with an external wifi antenna. It also features a power supply setup more complex than most nation states. It’s for sale for $71,000 via rv.mactom.com.